Six months after the 25 January Revolution, not much has changed in the relations between Egypt and Israel, according to the assessments of concerned Egyptian officials and some foreign diplomats in Egypt. "It is true that there has been no high-profile exchange of visits but this is not peculiar in the context of Egyptian-Israeli relations, and this is not to say that all visits has been suspended; there are still some middle and lower level visits that are being conducted," said an Egyptian official who asked to be anonymous. 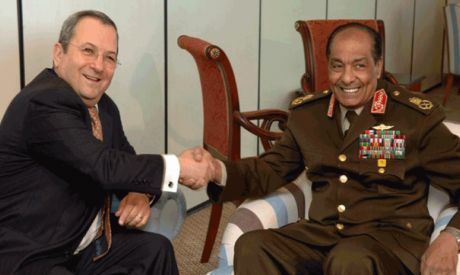 Economic cooperation and security cooperation, the main crux of the Egyptian-Israeli relations during the close to three decades of ousted President Hosni Mubarak are proceeding on with no major problems. An exception, however, is the natural gas exports from Egypt to Israel, which has been the most controversial aspect one of the bilateral cooperation between the two neighbouring countries. "There has been cut offs due to the attacks on the pipelines several times since the beginning of the revolution and it is true that the imports were never fully resumed," said another official source. H added, however, that this is "mostly due to technical reasons and has nothing to do with the public debate over the prices of natural gas imports to Israel". The issue of Egypt exports of natural gas to Israel has been subject to fierce criticism during the last years of the Mubarak rule. It was subject to an opposing public campaign and to a court case that demanded the suspension of the exports. Now, Mubarak himself is being tried on charges of corruption in this particular gas exports deal. However, Egyptian officials and Cairo-based Western diplomats say that "there is a commitment on the side of Egypt to keep the exports going". Egypt, according to the same sources, has decided – some say at least for now – to put off a request to significantly increase the prices of the gas exports. "The Israeli side had agreed to a symbolic increase in principle but said that it would seek international arbitration against any attempt to significantly increase the price agreed upon in the contract," said one Cairo-based foreign diplomat. And, according to a concerned Egyptian official, "Cairo realizes that the contract is written in a way that is in favour of the Israeli side and is trying to see how to attend to this matter away from arbitration". Overall, the same official added, this matter is not "causing a crisis in relations". A Sinai-based security source told Ahram Online that "firm security measure have been stepped up to avoid the recurrence of attacks on the pipelines". Meanwhile, Western diplomats in Cairo concerned with monitoring the bilateral Egyptian-Israeli relationship say they have not been reporting any significant change. In the words of one, "Members of the Israeli embassy in Egypt have still been meeting with the same people they had been meeting with before the revolution, although they might complain about an increased sense of public resentment". Another Western diplomat, who is also based in Cairo, said that Israel is "content with the way (Egyptian authorities) have been handling the Rafah Crossing Point" that links Egyptian eastern borders with the Israel-besieged Gaza Strip. "They got a little concerned in the beginning when (former Foreign Minister) Nabil El-Arabi spoke of a complete opening of the borders but at the end of the day they see that things are well-monitored and they admit that Egypt is still keeping an eye on the illicit tunnels that Palestinians built to pass from Gaza to Egypt," he added. According to the official narrative from the Egyptian side, all security coordination meetings have been taking place as scheduled. Egypt's demands of increased military presence in Sinai, beyond the agreed levels of the 1979 Egypt-Israel peace treaty, have been "immediately condoned" by Israel. "We had no problem getting an agreement on this matter," said the Sinai-based security source. He added that "it must be very clear to the Israeli side" that Egypt is really concerned over the infiltration of militant elements from Gaza into the Egyptian territories and that this matter has to be "firmly attended to or else ti would be a problem not just for us but also fro the Israelis". Accoridng to the same Sinai-based security source "the elements that have been instigating unrest in Sinai are not at all Hamas elements; they are much more radical". The upgrade of military presence in Sinai, according to security and official sources, would "immediately be decreased once the situation there is stabilized". This, however, is something that is likely to take some time – and Israel is well aware of this.